The Wall Street Journal features an interesting and important article titled “U.S. 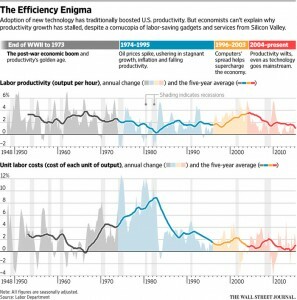 Productivity: Missing Or In Hiding?” It lays out Silicon Valley economists’ argument that official statistics fail to measure the positive economic impact of the latest technological innovations. The particular economist featured in the article is Hal Varian, one of the best in the business. Official measures of productivity — officially “labor productivity” — fail to measure many innovations that make our lives easier, better, more efficient and even more productive in some commonsense meaning of the word. It is true that the official productivity statistics show productivity declines in the past two quarters. Those negative numbers simply reflect the fact that the index measuring output lagged the index measuring hours worked, says National Center for Policy Analysis distinguished fellow Bob McTeer. Everyone’s perception of productivity focuses on the output efficiency of individual workers. More efficient workers make for higher national productivity numbers is the commonsense view, which does not square with the official arithmetic. Back in the day, my favorite productivity example came from my cotton picking days when I was about 10 years old. The adults working alongside me could easily pick three times as much in the same time. Their output per hour was three times mine; their “productivity” was three times greater. That’s what people understand. Inventions and innovations in the industrial age drastically reduced the labor component of output and chalked up substantial productivity statistics. That isn’t necessarily true for the products of Silicon Valley even though there’s no doubt that they are making our lives easier, more efficient, and more fun. But not necessarily more productive in the traditional way we measure it. So what about the idea that productivity has lagged during the past six months? It has by the definition we’re stuck with.